While much celebration has been had over Black women running for political office, the reality is that politics is a tough game. Between public scrutiny, harsh social media commentary and having to reveal intimate details about one’s life, being a candidate can equate to a harsh spotlight. Just ask Stacey Abrams. She’s been hailed as a rising star and is making a historic run for governor in Georgia. 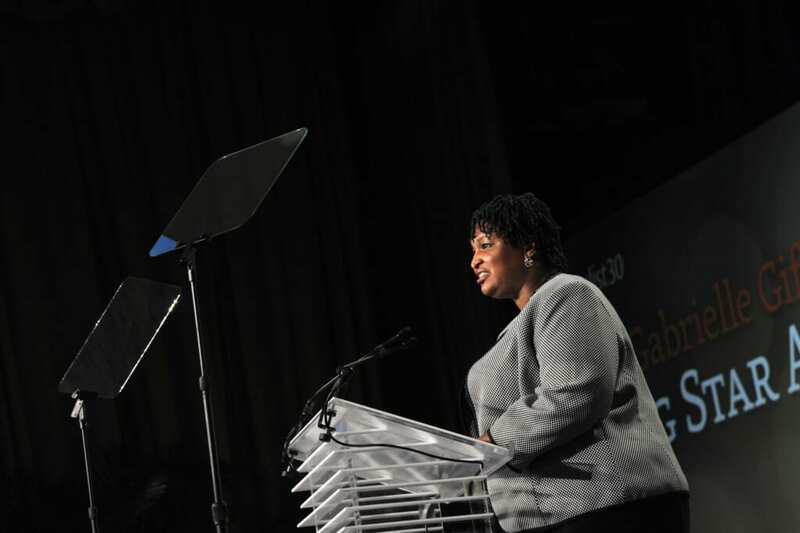 But Abrams’ recent revelation that she’s $200,000 in debt from accumulated student loans, credit card debt and tax payments, drew immediate criticism from opponents who seized the opportunity to undermine her leadership potential. Abrams however, is taking the heat and facing it head on. She just dropped a new book “Minority Leader: How to Lead from the Outside and Make Real Change,” and penned an open essay about her debt for Fortune. Abrams says her debt shows she’s just like many of the rest of us. And, that’s not necessarily a bad thing. She spoke with theGrio about why revealing the intimate details of her personal finances has been difficult, but completely necessary. theGrio: You wrote a raw and honest piece about being $200,000 in debt for Fortune magazine. It highlights the journey from growing up as one of six children to being a Yale Law School grad, all the while, still in debt. How does your story highlight the wealth disparity between people of color and white folks? Stacey Abrams: If you look at the wealth gap in America, white families create and hold wealth at higher rates than people of color. I think it’s $130,000 roughly for white families, for Latinos, it’s about $13,000 and for African-Americans its $11,000. Which means that for communities of color, any challenge becomes amplified dramatically. In my case, when my parents were hit by Hurricane Katrina, they didn’t have the savings to allow them to simply continue to take care of themselves. When they took in my niece after she was five days old, that additional expense…there were no savings waiting for them, there was no generational wealth to lean on, the only real wealth my parents created was in their six children. While I think they are very proud of us. They didn’t raise us to become their economic support system. But, for so many communities of color, especially for the Black community, that’s what we have become to our parents. Because my income goes to support my family and myself, I also struggle with the capacity to actually build wealth. In America, we confuse income with wealth a lot. Just because you make money, doesn’t mean you get to spend it or save it. theGrio: There is so much pressure to succeed when you’re “one of the first” in a family. Was it hard for you to open up in Fortune and make yourself so vulnerable? SA: I am a very private person, I am an introvert by nature. One of the challenges of being in politics in general for me has been the need to share more. Some of my colleagues believe I’m not as swiftly engaged as they would like and that comes from just an intrinsic sense of privacy, but this is important. It’s not just about me. I used my story to tell a larger truth, which is that there are millions of people out there who are telling themselves what they can not do. They can not run for office; they can not start a business, they can not leave a job that’s draining their soul because their debt makes them ineligible for opportunities. If I want to stand for public office to lead a state like Georgia, then I have to be willing to talk about my own experiences and create space for other people to know that their capacity is great. theGrio: Tell us what is your new book about? SA: The crux of the book is about having the space to lead when your life doesn’t look like the way people tell you it ought to because you’re different, because you’re a person of color, or because you’re a woman. theGrio: Many people have made comparisons [between your book] and Facebook COO Sheryl Sandberg’s book, “Lean In.” Can you talk about how they differ? SA: A lot of these books say ‘step up and lead.’ Many, however, don’t acknowledge where you’re stepping up from because a lot of us have been discounted. The assumption is that anyone can just step up, because they have access to the ladder and for so many of us, we’re still trying to make it. This book is a very authentic conversation about how hard it is to gain power when you don’t start with privilege. Yes, it’s hard, it’s going to be mean, but it’s still possible. theGrio: When we’re talking about this historic run that you’re making for governor, a lot has been said about you flipping a red state to a blue state if you win. Have you started to see people convert politically? SA: My mission is not the conversion of Republican voters, although I would be happy to have them. My mission is the engagement of voters who don’t believe their votes matter. I want them to be converted so that they believe that I will hear them and I will speak with them and for them. I would be grateful to have every disaffected Republican there is, but my campaign is designed and engaging voters of every race and community, who believe that no one hears them. I want them to believe I hear them and I have lived their life. theGrio: The ‘1881 for Abrams’ Coalition engages Spelman alumni and the student community to support your campaign. Did you watch Beyonce’s Coachella performance with pride as it shouted out HBCU’s? SA: I don’t believe you’re allowed to stay in America if you haven’t seen it [laughs]… I thought it was an extraordinary performance. Not only for musical and artistic ability, but also because of her nod to HBCUs and showcasing the diversity of Black women. She has this extraordinary grace with which she tells a story and that vision of our capacity is uplifting and exciting. theGrio: Many Trump supporters voted for the President because they believe he is a successful businessman. Do you think people will see your story and still trust you to lead as the Governor of Georgia? SA: When you are wealthy, debt is seen as innovative and clever and somehow noble. When you are not wealthy, it’s seen as irresponsible. The reaction that I’ve gotten from thousands of people is that they understand that some of the most effective money managers are those who have so little. I can defer tax payments; I can not defer cancer treatment payments for my dad. I can not defer making sure my niece has a roof over her head and food to eat. I can not defer health premium costs. Plus, I’ve managed, with my obligations, to meet every single responsibility I have honestly, ethically, and transparently. I am the best qualified to manage the resources in the state of Georgia because I’ve managed to deploy resources to meet every obligation and to deliver good solid results. I’m the only person in this race—in this primary—who has had to make the hard choices and deliver for everyone that is involved. I’m a good businesswoman and an excellent executive. I am also a real person who has had to make hard choices. Natasha S. Alford is a digital host and Deputy Editor of theGrio. Follow her on Twitter and Instagram @NatashaSAlford for the latest in news, entertainment, politics and pop culture. The post EXCLUSIVE: Georgia gubernatorial candidate Stacey Abrams explains how tough it was to reveal $200,000 debt appeared first on theGrio.